Cash Shop Update for November 8 | Dexless, Maplestory Guides and More! Discussion in 'Maple Updates' started by Nexon, Nov 8, 2017. November 8 to December 5 in the Special Promotions > New Arrivals category in both Reboot and non-Reboot worlds. If you’re going for the premium look, the Premium Surprise Style Box has the most sought-after styles in all of Maple World! Each Premium Surprise Style Box holds a permanent random decorative item! These items are regularly found in the Random Rewards > Surprise Box category in the Cash Shop. There are 100 different permanent items available from the Premium Surprise Style Box. In non-Reboot worlds, you can trade these style box items with other players through the Cash Item Trade window, if you haven’t equipped them. Right-click on a character to see the menu. You can also exchange them with NPC Ari, located near the Free Market entrance, and receive an Avatar Box Stamp. You can receive one stamp per item. This stamp is permanent and untradeable. When you collect enough stamps, you can talk to NPC Shiro, also located near the Free Market entrance, to exchange the stamps for a permanent equip item of your choice! Check out some of the most recent additions to the Premium Surprise Style Box. Flutter Flower Panama, Flutter Flower Knit, Flutter Flower Doll Weapon, Chained Princess Ribbon, Chained Princess Eye Patch, Chained Princess Dress, Chained Princess Boots, Chained Princess Chain Cape, Falling Darkness Hat, Falling Darkness Outfit (F), Falling Darkness Cape (F), Spider Chat Ring, Spider Label Ring, Falling Darkness Outfit (M), Falling Darkness Cape (M), Moonlight Sticky Cake, Moonlight Sorbet (M), Fuzzy Cotton Tail, and Starlight Lantern. November 8 to November 21 in the Appearance category in both Reboot and non-Reboot worlds. Take your Royal Hair Coupon to NPC Big Headward in Henesys Hair Salon, or your Royal Face Coupon to NPC Nurse Pretty in Henesys Plastic Surgery to get your new style! Royal Style Coupons are regularly found in the Appearance > Beauty Parlor category in the Cash Shop. You can preview the Royal Styles by double-clicking on the Royal Hair Coupon or the Royal Face Coupon in the Cash Shop. Check out the Male Hairstyles available now: Idol Shaved Head (NEW! ), Commander Will Hair (NEW! ), Hipster Wave Hair, Super Antenna, Mocha Hair, and Eclipse Hair. Check out the Female Hairstyles available now: Healing Loli Hair (NEW! ), Sugar Girl Hair (NEW! ), Moonlight Fairy Hair, Time-Saver Hair, Wave Ponytail, and Flyaway Fringe Hair. Check out the Male Face Styles available now: Dark Circle Face (NEW! ), Boing Face (NEW! ), Male Aran Face, Heartbroken Face, Cartoon Face, and Kiddo Face. Check out the Female Face Styles available now: Sparkling Pearl Face (NEW! ), Boing Face (NEW! ), Enlightened Face, Blushed Face, Eyeline Face, and Dewy-Eyed Face. November 8 to November 21 in the Special Promotions > Limited Time category in non-Reboot worlds only. Take home a cute little Yellow Chick pet! You can choose one pet, or you can take home a package containing three Yellow Chick pets! Summon the Yellow Chick pet to obtain the Yellow Chick skill, which will increase your Weapon Attack and Magic Attack. The skill will grow stronger as you equip more Yellow Chick pets. The individual pet package comes with an equip to wear, yummy pet food to eat, a pet dye coupon, a Pet Name Tag, and some useful pet skills and scrolls. You can change the color of your Yellow Chick pet using the pet dye coupon included in the package. November 8 to November 21 in the Special Promotions > Last Chance category in both Reboot and non-Reboot worlds. Put together a fun outfit with these permanent items! November 8 to November 21 in the Special Promotions > Limited Time category in Reboot world only. Take home a cute little Yellow Chick pet! Let this birdie join you on your adventures in Reboot world! November 2 (after maintenance) to November 21 in the Random Rewards category in non-Reboot worlds only. The Great Gachapierrot has added lots of new items! Check out the brand-new My Own Cozy Home, Cat Nap Chair, and State Fair Carrot Chair. Keep an eye on your popularity with the Fame Rank Chair. You can enter a message of your choice when you sit in the Cherry Blossom Picnic and Chalkboard Chair. Get your hands on the Cat Mug Random Chair. Each time you sit in it, you may see a different cat mug! You can also have tea with a friend. When you sit near each other in the Cutie Tea Time Chair, you’ll see an effect appear. Enjoy some tasty treats with the Bakery Chair, Café Chair, and Pudding Chair. Sail through the constellations with the Aquarius Chair, Aries Chair, Cancer Chair, Capricorn Chair, Gemini Chair, Leo Chair, Libra Chair, Pisces Chair, Sagittarius Chair, Scorpio Chair, Taurus Chair, and Virgo Chair. Take time to relax with Nue's Dark Flame Chair, Firefly Forest Chair, and Spooky Creeps Chair. Become part of the sky with the Beyond the Rainbow Mount, Cosmic Star Whale Mount, and Heart Constellation Mount. These mounts are all available as permanent versions. Become fuzzy and frisky with the Izuna Mount, Kurama Mount, and Glimmering Fennec Fox Suit Mount. These mounts are all available as permanent versions. Go head to head with the Maple Alliance against the Black Wings in these mounts, all available as permanent versions. Join the Maple Alliance with the Athena Airship, Claudine Airship, and Cygnus Airship. Or join the Black Wings with the Gelimer Airship, Lotus Airship, and Beryl Airship. New mounts have also come to Andersen's Box! 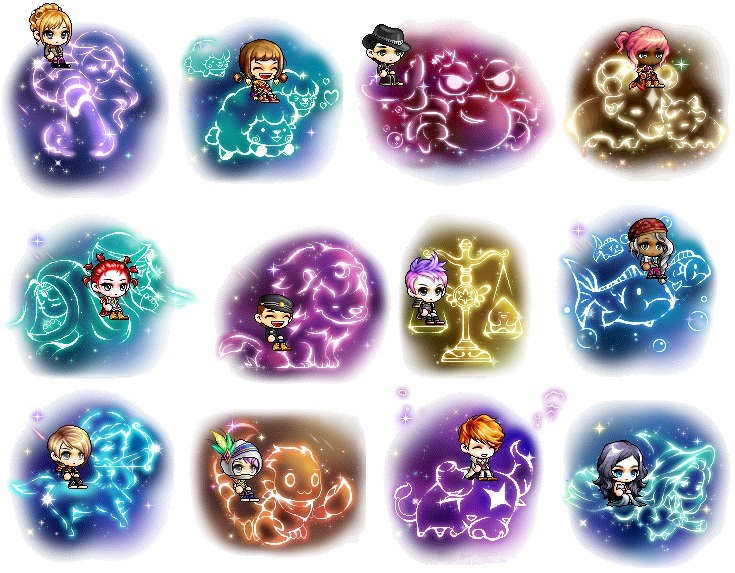 Get the Beyond the Rainbow Mount, Cosmic Star Whale Mount, Heart Constellation Mount, Izuna Mount, Kurama Mount, Glimmering Fennec Fox Suit Mount, Athena Airship, Claudine Airship, Cygnus Airship, Gelimer Airship, Lotus Airship, and Beryl Airship. These mounts are all available as 90-day versions. Andersen's Box is a special item that will give you one random in-game item when you open it! Andersen's Box can be regularly found in the Random Rewards > Special Items category in the Cash Shop. Click here to read more about Andersen's Box! November 1 to November 14 in the Special Promotions > New Arrivals category in Reboot world only. Open the Surprise Pet Box (available exclusively in Reboot world) to obtain one random pet! It contains both 90-day and permanent pets. Take home a permanent Puffram, Starwing, Skunk, Lil' Lotus, Ill Orchid, Gelimer, Salem Cat, Binx Cat, or Kit Cat. Make food your friend with a 90-day Strawbear, Bananabear, Cookiebear, Macha Man, Lady Hot Tea, Captain Café, Kiwi Puff, Berry Puff, or Mango Puff! Cuddle up with a 90-day Ice Knight, Mouse Monkey, Stjartmes, Toucan, Butterfly, Sassy Snake, Harp Seal, Elephant, Bichon, or Beagle! Explore the world with a 90-day Bonkey, Adriano, Craw, Monkey, Silver Husky, Brown Puppy, Mini Yeti, Penguin, Porcupine, Turkey, or Jr. Balrog! Get a great partner with a 90-day Baby Tiger, Black Kitty, White Bunny, Pink Bunny, Panda, Skunk, Kino, Mini Kargo, Dino Boy, Dino Girl, or Frankie! After purchasing the Surprise Pet Box, you need to open the box within the Cash Shop to receive one random pet. You can then move the pet to your character’s inventory from the Cash Shop. November 1 to November 14 in the Special Promotions > Last Chance category in both Reboot and non-Reboot worlds. October 25 to November 14 in the Special Promotions > Limited Time category in both Reboot and non-Reboot worlds. Put together a fun Halloween outfit with these permanent items! Get in a spooky mood with these permanent Halloween-themed effects! Double-click the icon or assign a hotkey to turn the effect on/off. Bring seasonal weather wherever you go! Enter a message of your choice, and the effect will display alongside your message. Flock of Witches gives Weapon ATT +30 and Magic ATT +30 to everyone in the map for 15 minutes. Spirit Haunt displays ghosts on the map. Sprinkled Candy displays candies on the map where your character is for 30 seconds. Haunt the channel with a Ghost Megaphone! Your message will be heard by everyone on the channel and a ghost icon is displayed.